We all thought we had lost our minds. It had started with an idea: with Children in Need around the corner, what is a unique way to raise money as a technology company using – you guessed it – technology. It’s our passion. And we have been doing some fantastic things with the rising technology of virtual reality. Hence, Novatech conceived the idea to recreate the famous French Le Mans 24-hour race… a nonstop endurance race with our staff on one of our own Atomic A3 motion simulator chairs. Without losing ourselves within the virtual (the World record for a single virtual reality session is by Australian Jack McNee, for 36 hours, 2 minutes and 16 seconds,) Novatech personnel volunteered their twenty minute slots to run between 9AM, 17/11/2017 to 9AM the next day. 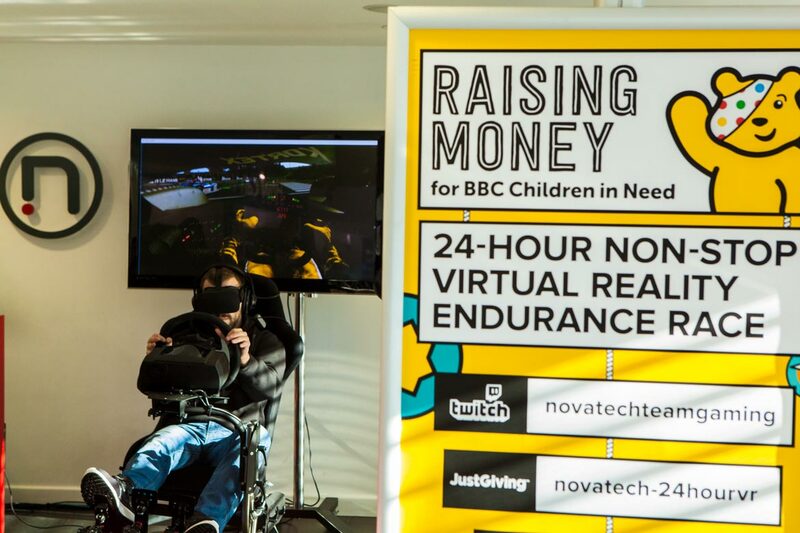 Streaming on twitch, the event would be broadcast live to a global audience, linked to the events’ own Children in Need donation page. Although many of our colleagues were thrilled, (‘Playing videogames… AT WORK?! ?’) there was the matter of the brave souls that were going to have to step up to man the early-hour sessions throughout to the morning of the Saturday. With the blaring audio of the race cars engines roaring in your ears, the realism of speeding tarmac before you, our volunteering colleagues suddenly realised that this was going to be a daunting challenge for all involved. The game was on. Spirits were high amongst the Novatech staff throughout the day. Everyone chipped in. 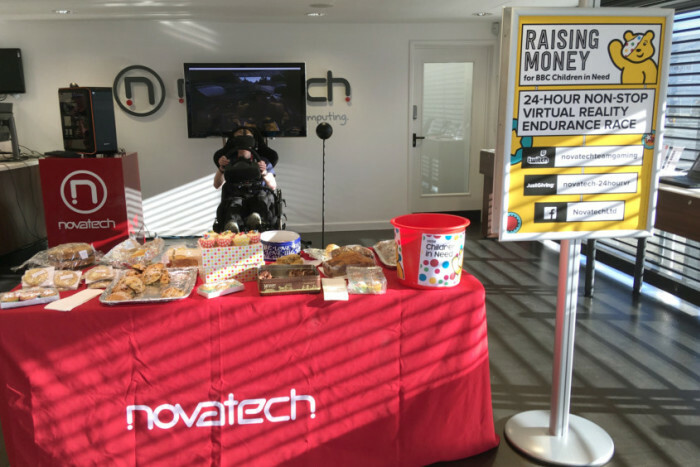 With the virtual reality simulator hauled down to our showroom, powered by a glorious water-cooled Novatech Hydro 104, visitors were greeted to a cake sale to raise further money for the charity, plus our employee’s zooming around on a virtual race-track. There was an excited electricity in the air. Portsmouth’s The News even popped in for a visit. Novatech’s dedicated crew persevered throughout the night, fuelled on a diet of coffee and red bull. Viewers throughout the day tuned in from around the world to glimpse the ongoing endurance race. It was enlightening to the connection that technology provides. There was a dedicated interaction amongst Novatech staff that by the end of the experience raised over £2,000 – 200% of the initial target. Thank-you to everyone involved in helping to make a difference with Children in Need. You can watch a vlog from Novatech’s own digital marketing executive, Jerry Hughes, as he records the teams journey through the night (and doesn’t lose his mind from lack of sleep).